At first, Sony DSC-RX100 may appear like just another point-and-shoot camera. However, the sleek and slim camera actually holds tremendous power and very high image quality. With the 20.2 MP Exmor CMOS sensor and Carl Zeiss Vario-Sonnar zoom lens, Sony DSC-RX100 is ready to make its way to the top of the charts. Sony DSC-RX100 is truly powerful and reliable, and is a great upgrade for the point-and-shoot photographers. Due to the slim and sleek design, Sony DSC-RX100 may appear like a point-and-shoot compact digital camera. Even so, we can’t deny that the camera looks sleek and stylish. The aluminum housing feels solid, featuring a sweet black matte finish. On the top of the camera, you can find an integrated flash that can snug neatly into the body to keep the thing compact. With the slim and lightweight design, Sony DSC-RX100 is greatly portable. You can easily slip it into your pocket as you go. On the rear, you can find the button and dial controls. Depending on your preference, you can be either pleased or disappointed that the display is not a touchscreen. More modern users value the touchscreen control because touchscreen is neat and intuitive, but others, including many professionals, hate the unpredictability of the touchscreen control. Nevertheless, having no touchscreen is not a big issue for Sony DSC-RX100 even if you are already used to the feature. The 3” display has 1.2M dots. The dial and buttons controls are solid and precise. There is also a customizable front control ring that can be handy for quick access. 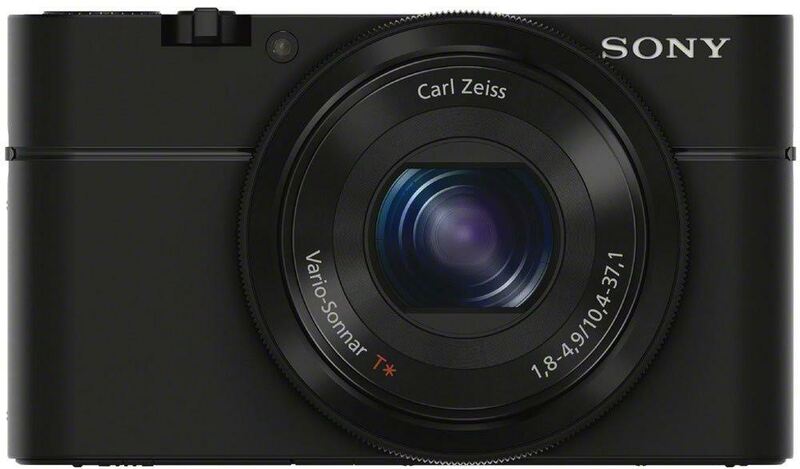 Sony DSC-RX100 is equipped with the Carl Zeiss Vario-Sonnar zoom lens, which can provide up to 3.6X optical zoom.The focal length is 28 – 100 mm equivalent, and the aperture is 1.8 – 4.9. The lens is solid and easy to control. There is a built-in image stabilization system. The optical SteadyShot IS performs excellently in eliminating blurs from still images and videos, even if you shoot at the higher zoom levels with trembling hands while walking. That is an exceptional feat. Despite the compact size, Sony DSC-RX100 is packed with a sensor physically larger than the usual. The camera comes with a 20.2 MP 1.0” Exmor CMOS sensor. This sensor enables the camera to take the fullest advantage from the lens to capture ultra-high definition images. The still images have superb sharpness and details. The colors are full, solid, and accurate. And thanks to the advanced column A/D processing, low-light images are truly astonishing with incredibly smooth and clear details. Sony DSC-RX100 can record videos in up to 1080p Full HD at 60 fps, with manual control and dual recording capabilities. The shutter is very fast and very responsive, even though the maximum shutter speed is only 1/2000s. The camera can shoot continuously at 10 fps in the burst mode. The native ISO is 125 – 6400, extendable to 80 – 25,600. The ISO performance is exceptional. The AF is incredibly fast and accurate, even in low-light conditions. Check the best price of Sony DSC-RX100 here!